Composite decking provides many options, most of which are recycled and environmentally friendly. The final product typically combines the attractiveness of average wood and stain-resistance of plastics. For the most part, maintaining a composite deck should be easier than doing so with a wood deck. It is advisable to clean your composite deck annually with a trusted cleaning product of your choice. After doing a quick google search, you will find a variety of different cleaning products that are more than capable of giving your deck a thorough cleaning. Following the instructions of the selected cleaning product of your choice will lead your deck to looking crystal clear. If you spill anything on the deck, your go-to method of cleaning it should be to treat the affected area as quickly as possible with hot, soapy water. Once the water is applied, rinse the area thoroughly. It is imperative to get to the area right away because if the spill sits for too long it can stain the deck boards. Should your deck boards get damaged by a spill, you should try using a mild household cleaner and a stiff brush. Another source of trouble you should be wary of is patio furniture. Mild scratches may occur on your deck surface from dragging furniture. Using a wire brush will easily smooth out the scratches. Try to brush with the grain pattern shown on the boards, because going across the grain will damage the appearance of the deck. The most important tip we can offer regarding your composite deck is to consider the benefits of power-washing your deck. Power washing will save you lots of time and effort given the simple process involved. Make sure you use a fan tip on the nozzle as opposed to a straight tip. The nozzle should be kept at last six inches away from the deck. If you have an older composite deck, it will soften over time. Using too much pressure will damage your boards, as will getting the nozzle too close. Installing a composite deck will not only help to serve the environment, but it will also save you lots of time on maintenance as opposed to classic wood decks. If you feel that after reading this, installing a composite deck colorado springs is the best option for you then Oleary and sons would love to speak with you. 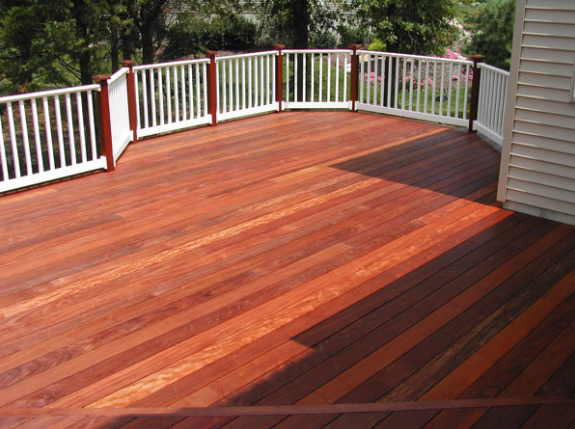 Estimates are free, and Oleary and sons has been serving Colorado Springs with the area’s decking needs since 1988.